In November 2016, Charles earned his Million Mile Jacket with TransAm Trucking. 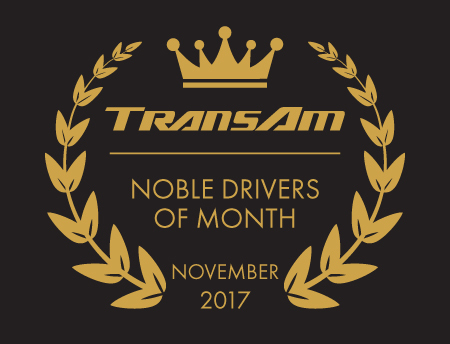 Now we have the honor of recognizing him as November 2017’s Company Driver of the Month. Charles has a great outlook on life and a positivity that just will not quit. No matter the situation, he is able to take a step back and see it from all angles. “He is truly a NOBLE person,” says Heather, his Driver Manager. “He never raises his voice, even in difficult situations. He remains calm and understanding. I sincerely enjoy working with him.” Thank you, Charles, for making the rest of us smile. Having you on the team brightens our day. We hope to be with you for the next million miles. Most of the time when there is an accident, people like to slow down and look but will not stop to help. Not Cheryl. Last month, when Cheryl came across a truck accident on the side of a road, she pulled over. She wanted to make sure the driver was ok. He was, but badly shaken. Cheryl made the decision to stay with the driver and help calm him down. When he was able, she then helped him document the accident and gave him her contact information in case he needed anything else. Cheryl is a great example of why truck drivers are noble people. From all of us at TransAm Trucking, thank you Cheryl for looking out for a fellow driver! Everyone remembers their first solo load. It can be intimidating. Luckily for one driver, Ivory was there to lend a helping hand. Ivory was at a receiver when he noticed another driver having trouble with a backing maneuver. Ivory coached the driver through the process, but he did not stop there. He stayed with the driver and offered support through the entire unloading process. Ivory even shared tips on where to go for a break once the trailer was unloaded. “This was a very Noble act!” said Penny, Ivory’s Driver Manager. We agree! Thank you, Ivory, for sharing your experience and taking time out of your day to help another driver. We appreciate your noble act. Whether Robert is with his own mentee or a group of new drivers, Robert will answer anyone’s questions and share stories about his driving experience. “Robert offers his upbeat experience about being an Independent Contractor and hauling freight for TransAm Trucking to anyone who asks,” shares TransAm Trucking’s Manager of Training & Development, Darren Whiteside. Robert recently helped with a group of mentees on TransAm Trucking’s backing range while waiting for a load. A few of the mentees asked him for pointers while they waited for their turn. “Robert offered some advice, but he said the best way they could learn [the maneuvers] was to pay close attention to what our Driver Trainers were teaching and to follow their instructions.” Thank you, Robert, for being a part of TransAm Trucking’s mentoring team!